We have a cabin out along the back of the property, overlooking the river. We offer it to company of the more adventurous sort, but I also use it as a retreat in the fall when, like Ratty, I feel restless and want to break away from the clutter that ties me to my daily grind. On those nights I carry a basket with matches, canned milk, oatmeal and a pan, water, and tea, so I can rise early for breakfast and writing before I return to the big house for homeschool lessons. 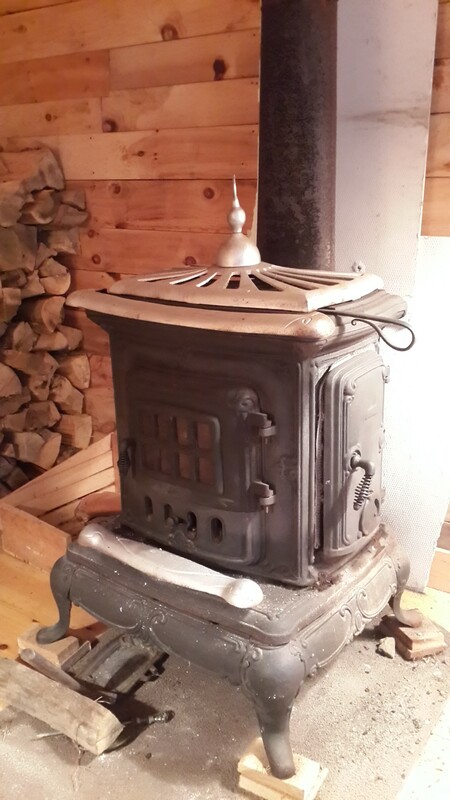 I keep the old woodstove going through the night so that in the morning I can put on a kettle for tea and a pan for oatmeal. That aluminum heat radiator comes off. It has electricity but can’t quite catch the wireless, and that is a good thing. 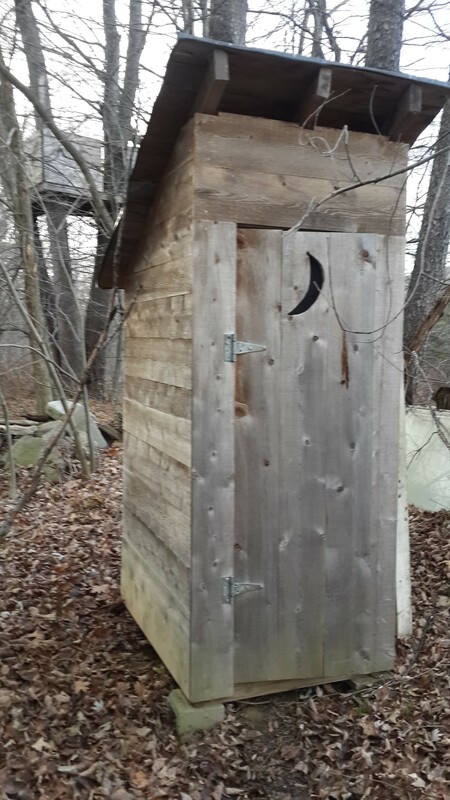 It has no water but it does have an outhouse. I write out here when I can but I have to say I don’t like how dark it is. Simple, uncluttered, yes. Remote, yes, yes. But something in me requires an open view, a portal beyond my box, which, now that I think about it, is a perfect metaphor for the creative act of writing. Here is what I have. Lovely, isn’t it? I saw this image on Facebook and do not know to whom to credit it. This is what I would like, and Bob the Builder says it would be fairly easy to put windows in that back wall. This is how my desk looks now. 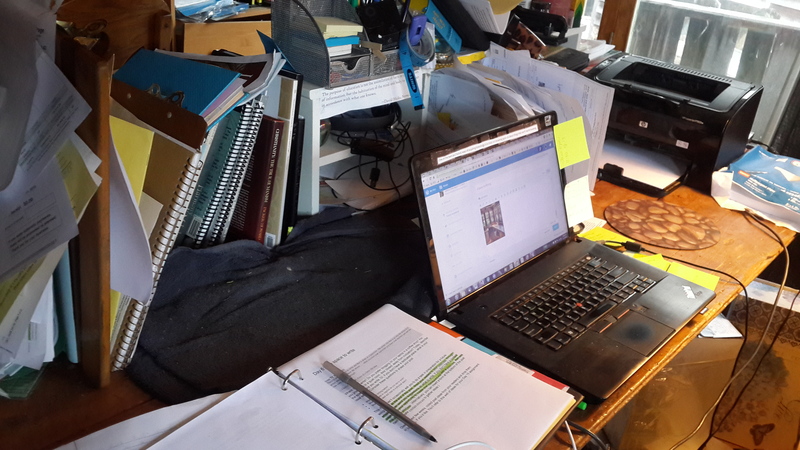 Since this is also Command Central, where I handle the family’s bills, college search, school planning, Grandpa’s paperwork etc, papers abound and I can always find something I should be doing beside writing. The cabin retreat makes sense. For November I have joined the WordPress Writing 101 class, which posts daily prompts. I write when I can, getting up early in order to be done before the boys and I work on our Latin lesson at 9:00. The act of writing teaches us; vague thoughts coalesce into something new and unexpected. 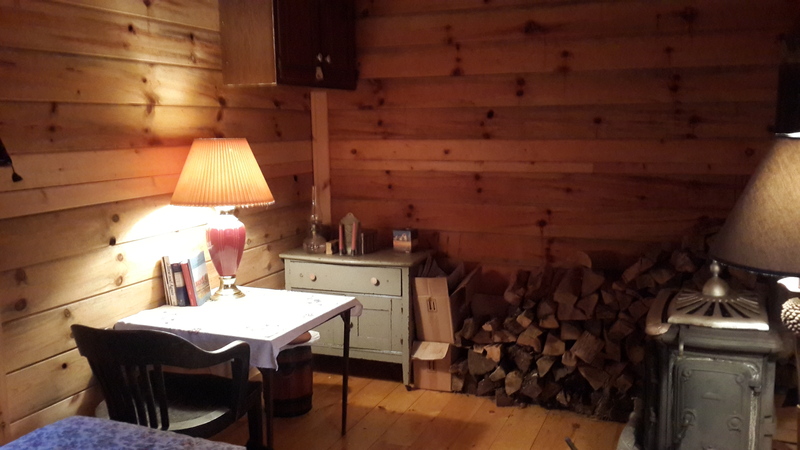 This assignment opens my eyes to the beauty of that cabin as a regular writer’s retreat. It means making a fire early to warm the place up but the men in my life have stacked me quite a pile. I have all I need, windows or no windows. After all, writing is a deeply internal activity, and every writer knows how to see through portals into the vast universe of the writer’s soul. Today’s prompt also asks me to link to my contact page and ask for suggestions on what to write. Have an idea for me? A challenge? Something you would like to know more about? post in the comments or go to the Contact Page, linked at the top next to About. This entry was posted in Writing about writing, writing101 and tagged cabin, windows, WordPress, writing101. Bookmark the permalink. Thanks! 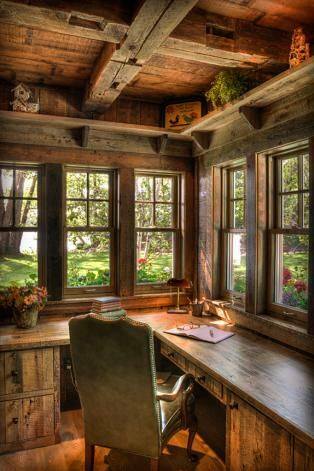 Do you like your writing area? My kind of place. I could live there all year round. Sweet, isn’t it? When my forester-husband and I were first married our house was like this, though four times as big. That first winter was lovely. After living in the Washington DC area for six years I found it incredibly restful; I could actually hear myself think. I do find hospitality breaks up what can become monotonous. Even Thoreau entertained guests on Walden Pond. I hope you have found some place of retreat. We have a six bedrooms Victorian/Edwardian country house with a huge cottage garden. I love all of this. Really lovely. 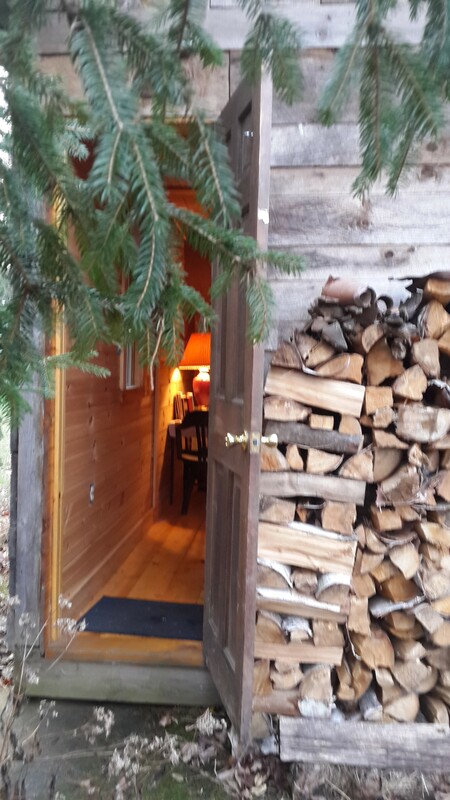 You have a beautiful cabin, and I love that woodstove. 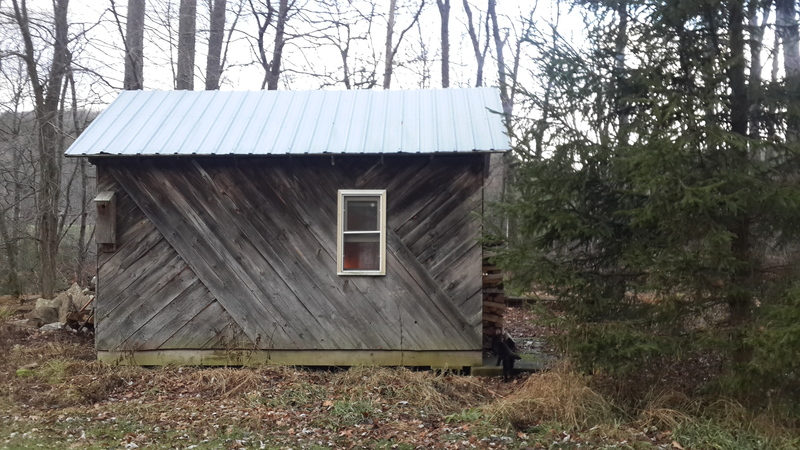 My husband and I moved into a tiny house four months ago (we would’ve loved to have a woodstove but our interior isn’t big enough — no way to fit one inside given the clearances it needs!). I’m getting used to (and really loving) living in the woods. Great post — thanks for responding to this assignment, and I’m so glad that it opened your eyes to the beauty of this space! I love those tiny houses. The link above doesn’t work. Is it your home or a tiny house site? Thanks for your comment. I want you to write about the college search. Not the logistics of it, but what it feels like to be a homeschooling parent helping your kids to find and pursue a college—what you learn from it, about them and about yourself. Wow. What a great idea. Thanks, I will.